The Moving Picture Blog: Killer rabbits! Slumming actors! Spooky music! Coming soon to Turner Classic Movies! Killer rabbits! Slumming actors! Spooky music! Coming soon to Turner Classic Movies! 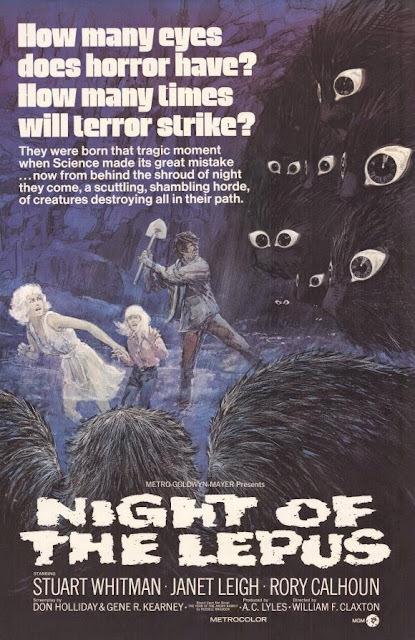 Every time I hear that this or that "classic" horror flick from the '70s or '80s is going to be remade, I can't help wondering: Why don't they try to give us a new and improved Night of the Lepus? Could it be that even the most imagination-challenged and innovation-averse hacks in Hollywood recognize that there's no way to surpass the totally unhinged splendiferousness of this 1972 camp classic? Yes, you read that correctly -- classic, dammit. Which is why it's airing Oct. 23 on Turner Classic Movies, as part of the cable network's month-long tribute to the late, great Janet Leigh. Not surprisingly, the original trailer and advertising art kinda-sorta disguised the fact that the scary monsters in Night of the Lepus are... well, killer bunnies. But the rampaging rabbits are ready for their close-ups in this inspired clip compilation. And you can see what happened when the RiffTrax guys took their best shots at the ferocious floppy-eared fiends here.